The Rising Sun, Nutbourne, originally uploaded by pica pica. Pen drawing of The Rising Sun, Nutbourne, Pulborough, West Sussex. Rose - Brother Cadfael, originally uploaded by Maggie Goodsell. 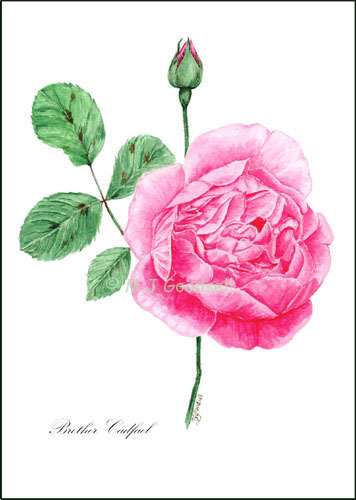 Notelets of this watercolour painting of the David Austin English Rose "Brother Cadfael" are available as part of my Rose series. Narcissus, originally uploaded by pica pica. Acrylic painting on canvas 10" x8"
White narcissus on a dark green background. The original painting can be bought from my website. Chequers Hotel, Pulborough, originally uploaded by pica pica. This 16th century hotel, at the top of Church Hill in Pulborough, was once the annexe to the original hotel in Church Place. This burnt down in 1963 and was never rebuilt. Greetings Cards reproduced from the original pen drawing are available from my website. Primula vulgaris, originally uploaded by pica pica. This garden primrose forms part of one of my Garden Notelets series. The original watercolour was painted on Saunders Waterford HP paper. Once I've got the hang of blogging I shall put up paintings and cards as I add them to my website. Watch this space.